DALLAS(WBAP/KLIF News)-In an effort to increase aviation careers among women, The Frontiers of Flight Museum hosted Girls in Aviation day today. 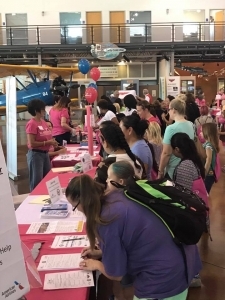 Over 500 parents, kids and educators took part in the day across the world that focuses at decreasing the gender gap in the aviation career field. Girls from age 8 to 16 had the opportunity to interact with female pilots, engineers, dispatchers and tour specialty aircraft.